Malcolm Peacock is a young, Black, performance artist living in Richmond, VA. His most recent performance, “Until I See You In Me”, was a laborious trek where the artist dragged an over 60 pound box down the historic Richmond slave trail. For three miles, Malcolm dragged this box to the final destination of the Slave Burial Ground. This box, built to match the dimensions of the box Henry Box Brown used to ship himself out of slavery, was full of tokens of what local Black people feel represented liberation. 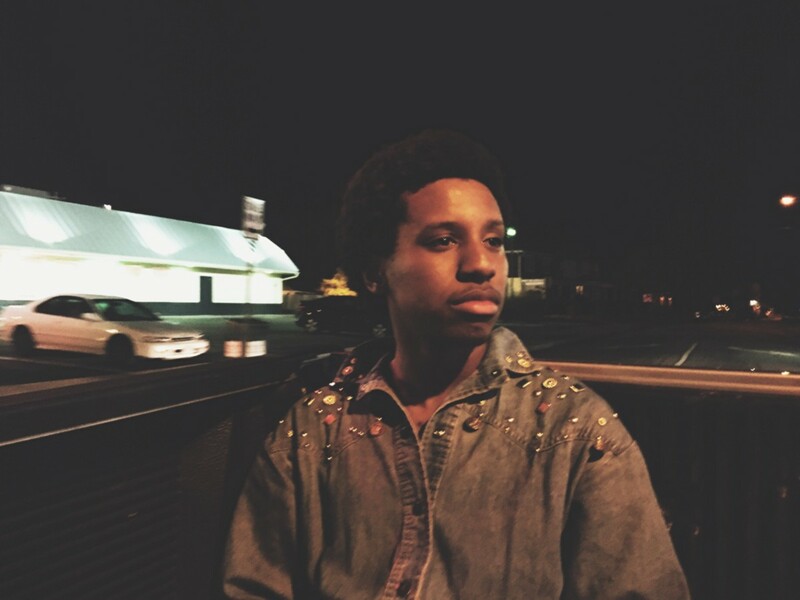 A portrait of Malcolm taken by Taylor Janay Manigoult. Taylor Janay: Where do you consider home? Malcolm Peacock: I consider home to be two places. Baltimore, Maryland and the state of North Carolina. I was born in NC and I still have a lot of ties there. It is where my father and cousin are buried a few feet from each other. Baltimore is where I grew up and where my mother and sister still reside. TJ: So family is important to you. Can you talk about home influencing your work? MP: I’ve always liked to say the word house for a place that I sleep or dwell and home for a place that I feel safe (in all dimensions of that word). But to address the question, home plays a part in my work because it is a big reflection of my identity. So much of myself is in my home and so much of my home is inside of me. I learned the most about my identity in my homes as a child growing up around my strong willed parents and siblings. Home is a reminder of what I am made of but also it charges me by reminding me of the many things that I have to look forward to. I was raised in a very “go get it” type of family. TJ: I totally see that. You have done a lot of radical performances and your work is charged by your political identity. How is this identity as a young, gay, Black man important to your artwork? But it’s also taking the contemporary Black body and doing the same thing. Making it public is important though. If it’s just in the studio, the gallery, the museum..it’s not necessarily being accessed by people who deserve to know that they can live within these different identities and still thrive. TJ: Can you speak a little on your last performance, “Until I See You in Me”? MP: This piece was born out of self liberation and the realization that in order to feel more connected to the historical and contemporary Black people that have inspired me to live, I would have to empower myself…not ask someone else to recognize then empower me. I thought of slave revolts and how logical they were. In order to gain freedom, something that they were deprived of…they would have to undergo the exact opposite of what was done to them…they would have to convince each other that they were a) worthy of freedom and b) powerful enough to gain it. This makes so much sense because many Black scholars say that if you’re not ready to die for your freedom then you’re not ready to fight for it. With these thoughts filling my head space that day, I began to think of what it would mean for myself and other Black people living in Richmond, the capital of the confederacy and the city that was the largest slave market on the east coast, to feel liberated. 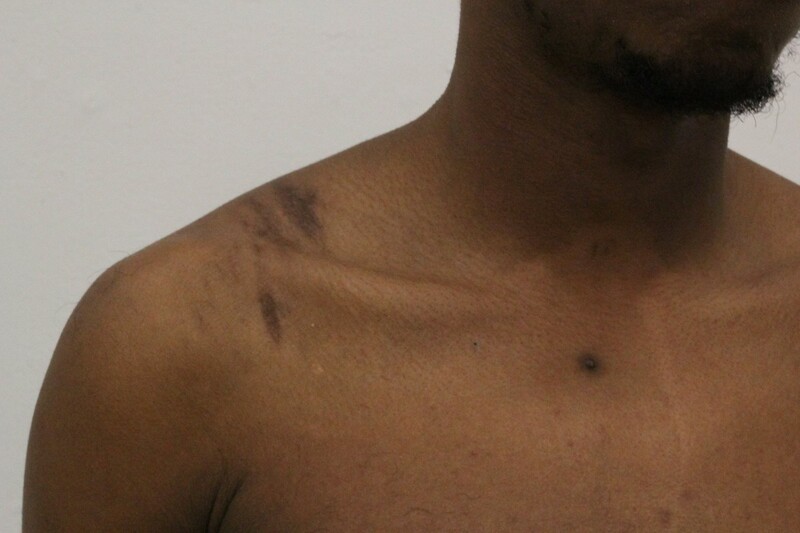 The bruises left on Malcolm’s shoulders from the rope he used to attach himself to the box. TJ: I was curious about your usage of the rich racial history that exists within the land of Richmond, Virginia. How is this landscape connected to your narrative and your work? MP: Right, so as far as my narrative goes and the course of my life, I look back on my time in Richmond and think wow, this place is awful. Really. It is an awful place that is existing (not living because I don’t believe much of anything happens here I would never say it is alive) literally on top of the work of oppressed slaves and it somehow has managed to bring colonialism into the present day. But Richmond charged my work. It brought out the parts of my life that I was afraid of. It got under my skin but I was determined to not let the city ruin my life. Although it brought back the most abusive memories of my life while living in Baltimore and traveling to other countries at times, it showed me that I need to confront racism and that I can’t let it consume me and that assimilation into whiteness is unacceptable in my opinion. TJ: Wow. Richmond has done a lot for you in terms of radicalization. and I noticed that experience was a part of one of your previous performances. MP: Yep. that piece is really important to me. I have been thinking a lot about power, freedom, and fear. And I’m not the first to say this obviously but it’s taken me 21 years to realize that freedom (although complex) is simple in ideology. It’s the removal of one thing usually done in what would be considered an extreme manner in order to achieve the good. A slave revolt is a perfect example. Freedom is connected to death and people don’t get that but it’s the key. If you’re not afraid to die then you will do anything for freedom. Freedom is the unapologetic conquering and erasure of fear. it’s all life or death..no in between. because Monument Avenue happened when the south needed to preserve its LIFE. not its life style its LIFE. Slavery was their way of life so when they couldn’t have slaves it was like they were dying. which is so sad and crazy. so the monuments stand to preserve their life. and that’s why Black unarmed people are being killed regularly…the fear of a Black planet is a sign of death for oneself. So why would you not kill us? TJ: Yes yes yes. Your last performance, Until I see You in Me, contributed the voices of other Black people. MP: I wanted to know what other Black people thought liberated them. What do they draw inspiration from and what makes them feel empowered to thrive in a country that was built upon the abuse of their ancestry? I began to ask Black people in Richmond if I could have an item that they felt liberated them. The responses were overwhelming as I was given some of the heaviest items I have ever had the honor of carrying. Hair pics, coconut oil, bibles, photos of old family members in Liberia, small books written to our unborn Black daughters, islamic prayer rugs, diaries, speakers, the original Black GI joe doll, books upon books, upon books…I could go on. Heavy…in weight of course…but also in content and power. I felt that we were important. When trying to consider the way in which I would carry these objects I had thought of a boat. A pretty literal interpretation of the way in which slaves were transported. But after some research I realized that there was only one option and that was to carry the items in a box the same size as Henry Brown’s box. The box that I would say is his box of liberation. Like Brown, I chose to go forward with this work…to feel and show a greater sense of liberation. Brown chose to box himself up, without almost any air…to gain his freedom. Without being given a way, he made a way. Writing that makes me tear…how brave of one man. To risk his whole life in a box…he had to have known it was going to work. It had to. I don’t think the world has forces that exist that are more powerful than someone who is that smart and that brave. 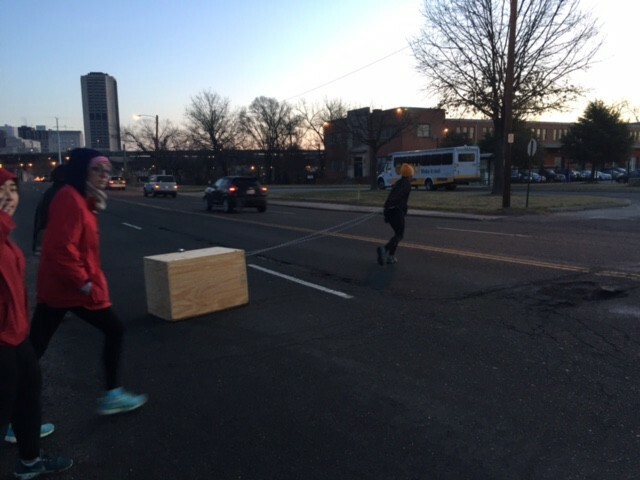 TJ: I see that bravery in your work…you act unapologetically and daringly, for instance….dragging an over 60 pound box two miles. MP: Three miles…hahaha.. and yeah dragging, running that thing….damn. Honestly it was a crazy day. It was over 60 pounds. The ending of the piece really got to me. I definitely did this for so many reasons, but those all came to focus at the end. I began to cry immediately trying to open the box. It was perceived as sadness and frustration because I could not open the lock. I was honestly just so excited to open the box. I wish I could re live the moment of kneeling over the Islamic prayer rugs again. I don’t know what it would feel like again. Not the same but…who knows? Although, nobody could see him next to me on the rug that held the wet North Carolina A&T long sleeve t shirt, my father was kneeling next to me on that rug. Just saying to me, like he always had, “And remember, you belong”. I see him in me. I see all of the box in me. I see the box in my friends and family…in the broadest sense of the word family. And this is what we will do to feel more connected to what is driving us each and every day.